Super Hero and I were delighted to play with this kit. It contains everything needed to uncover a mummy and 4 sarcophaguses (or is it sarcophagi) inside a pyramid. Super Hero had to first decipher the entry way (where to dig) by looking closely to the hieroglyphics with a magnifying glass. Then he had to chip away, once we got the top of the pyramid to flip up, he had to brush away the debris to uncover the hidden treasures. 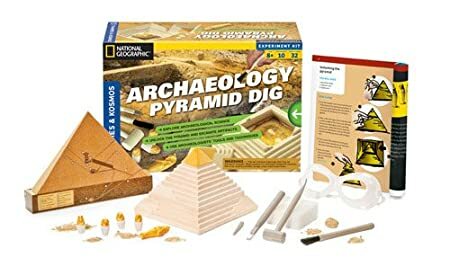 Another fun kit Super Hero was given as a gift (thank you Maria Claudia and Silvana for this fun toy) was the National Geographic archaeological egyptian sand clay sculpting kit. We got to knead some clay and squeeze it into a mold with the shapes of King Tut, a pyramid, a cat and a sarcophagus. After they were all dried a couple of days later, Super Hero painted them with the bright, colorful paints included.